Brick Township’s Colorado Park, located at the end of Colorado, Nebraska and Oregon avenues, will now bear a more broad representation of the neighborhood in which it is located. 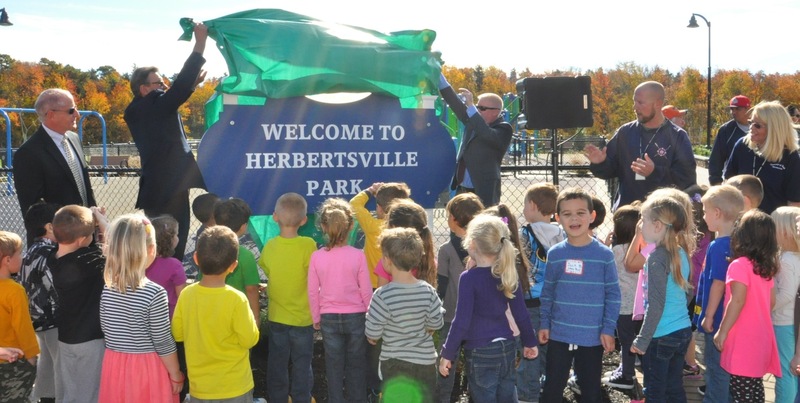 Mayor John Ducey and township officials re-christened the park Herbertsville Park this week, introducing not only a name change but a number of significant upgrades. The rebuilt 4.6 acre parcel, off Lanes Mill Road, now features two age appropriate playgrounds, two basketball courts, a softball/baseball field including player benches and backstops, a quarter mile walking path that spans the entire park and connects to the adjacent neighborhoods, an improved parking area and enhanced landscaping in the form of 400 various trees and shrubs. Construction on the park took place over the summer. The upgrades were funded through a $998,452 contract that was awarded in April, paid through the township’s capital improvement plan.